The rivalry between the U.S. and Russia could take on a different tone in the coming year. Russia has dominated the headlines in the U.S. over the past couple of years. From election meddling to geopolitical maneuvering, Russia has been trying to assert its influence on the global stage. It's something the country has been able to afford to do in part because of all the petrol dollars flowing in. Russia is, after all, the world's leading oil producer. However, its current dominance of the oil market, which is due in part to Saudi Arabia's decision to curb its output last year to boost oil prices, is about to face a challenge from a foe no one would have expected a few years ago: America. That's because the U.S. is expected to pass Russia as the world's largest oil producer within the next year, according to a forecast from the International Energy Agency (IEA). Russia currently produces just under 11 million barrels of oil per day (BPD), which is about 11% of the global supply and slightly more than Saudi Arabia. That's the country's highest level in 30 years and comes even though it joined the Saudi-led OPEC coalition and kept a lid on its production last year. The post-Soviet-era high is a notable improvement for a country that saw its output fall sharply after the collapse of communism, when it was producing less than 6 million BPD in the late 1990s. Fueling Russia's recent rise has been its investments to boost output in the Arctic region. Last year, for example, oil from the Yamal-Nenets area in the northern part of the country's central region rose 13.4% thanks to rising production from several new onshore oil fields developed in recent years. Russia, for example, recently brought the Vostochno-Messoyakhskoye field online, which is the northernmost onshore field in the country and cost between $15 billion to $18 billion to develop. It's one of several Arctic oil developments by Russia that have tapped the vast oil supplies sitting underneath that icy region. 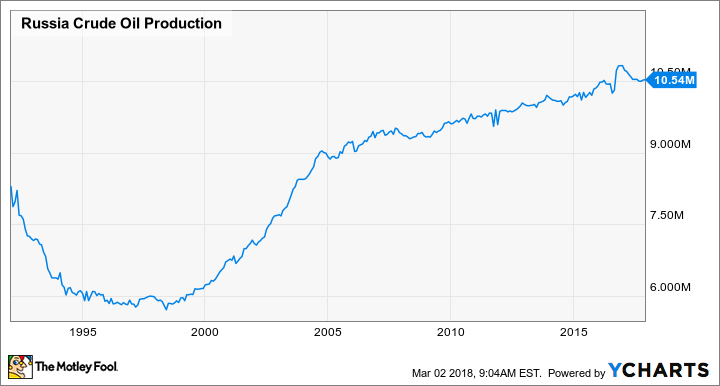 But while Russia has slowly rebuilt its oil output over the past few decades, America's production growth has occurred in a stunning burst. After peaking at around 10 million BPD in the early 1970s, the country's oil output steadily declined as legacy fields depleted, falling below 6 million barrels per day and staying there through 2012. However, thanks to the American ingenuity of combining the technologies of hydraulic fracturing with horizontal drilling, the country has unleashed a gusher of new output over the past five years. That move pushed the country's production above 10 million BPD last year and had the U.S. on pace to exceed 11 million BPD by the end of this year. This forecast leads the IEA to believe that the U.S. will overtake Russia as the biggest oil producer within the next year. What's surprising about the country's oil rebirth is that big oil behemoths ExxonMobil (NYSE:XOM) and Chevron (NYSE:CVX), didn't lead the way, since both had focused their attention on identifying opportunities elsewhere around the globe, including Russia. Chevron, for example, is a major investor in the Caspian Pipeline Consortium, a $5.4 billion pipeline expansion that started construction in 2011. ExxonMobil, likewise, had been looking toward Russia to supply it with growth, including securing a $500 billion offshore exploration partnership in 2012. While those big oil giants were scouring the globe in search of oil, home-grown upstarts including Continental Resources (NYSE:CLR) and EOG Resources (NYSE:EOG) were beginning to tap into the country's mammoth shale resources. Continental Resources, for example, deserves much of the credit for unlocking the Bakken Shale field in North Dakota. In 2004, the company completed the first commercially successful well in the state using a combination of horizontal drilling and hydraulic fracturing and also finished the first well in the adjacent Three Forks formation a few years later, which helped unlock a multibillion-barrel treasure trove of oil in that state. Meanwhile, EOG Resources, which broke away from Enron in 1999, helped lead the discovery of the Eagle Ford shale play in southern Texas in 2008. The company is currently the largest producer in that region and estimates it can pump out 3.2 billion barrels of oil and gas in the coming years. The knowledge the industry gained from unlocking those fields has transferred to other regions, including the Permian Basin, which some estimate to be the largest untapped oil field in the world, giving the country ample fuel to keep growing production. In what seemed unthinkable not that long ago, America has become an oil-producing powerhouse. It's coming at the perfect time, as it gives the country an edge over Russia in that key global battle. America's oil renaissance also has the potential to enrich investors in U.S. oil stocks, given the gusher of a cash flow these companies expect to haul in this year now that oil prices have improved. Continental Resources, for example, believes it can produce upwards of $900 million in excess cash this year, while EOG Resources sees the potential to generate more than $1.5 billion in free cash. Those huge windfalls make now seem like an ideal time to consider buying U.S-focused oil stocks.